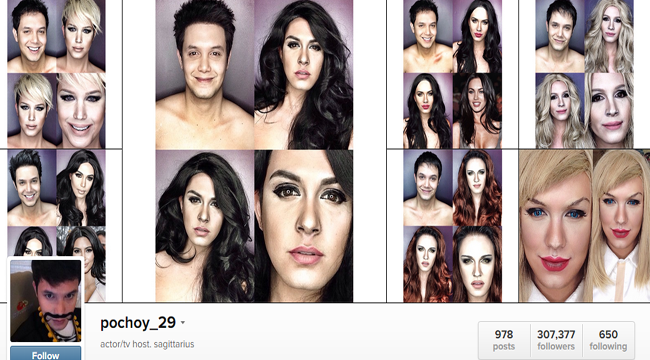 Paolo Ballesteros is not only known as a mainstay host of Eat Bulaga but also with his many transformations making himself not only look like local actresses but also big international celebrities. The actor-host with many faces not only does it just for whim, he does it like a professional make up artist. It all started during the Eat Bulaga’s segment ‘Super Sereyna’ as he surprised the audience with his various transformations week after week. According to him, he does his own makeup and learns through various tutorials in YouTube. He is very particular in every detail and intricately applies makeup in every way that he could make his transformation as close as the celebrity that he wanted to portray. As the actor-model posted each of his transformations in his official Instagram account, people express their awe as he seemed to be both handsome and pretty at the same time. Each detail had been attended to, making him seemed to look like the celebrities themselves, who are all female. Including the celebrities that he had almost , if not yet, perfectly portrayed are Angelina Jolie, Miley Cyrus, Marian Rivera, Drew Barrymore, Taylor Swift, Princess Diana of Whales, Kristen Stewart, Julia Roberts, Jennifer Lawrence, Megan Fox, Beyonce and so much more. The Filipino host did not stop with makeup, he had even gone further and used appropriate wigs and contact lenses to complete the image. Each of the posted photo of his work of art did not fail to gather likes and comments from fans and other netizens. He did not limit himself with only one craft and at the same time he had provide a unique way of entertainment that only he could give. His dedication surpassed the challenges of impersonating people and everybody would see that he himself enjoys it.